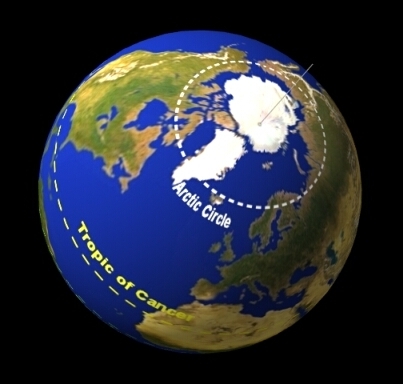 The Arctic Circle is one of the five major circles of latitude that mark maps of the earth. North of the Arctic Circle, the sun is above the horizon for 24 continuous hours at least once per year (polar day) and below the horizon for 24 continuous hours at least once per year (polar night). The Bible states that God “sits enthroned above the circle of the earth” (Isaiah 40:22a, NIV). The Hebrew word used here means “horizon,” which is circular. The horizon is the apparent junction of earth and sky; defined boundaries that merge like the curved part of a plow. God sits enthroned above the horizon as the Creator of its curvature—He provides the edge as well as the blend. God rules from a position of polar day—the light of His presence never stops shining and the proof of His power never dips below the horizon. He is the pole or axis around which the rest of creation revolves. He is the crux—and His is the cross—upon which everything turns.